This type of torta was sold at a street food stand in my hometown of Tampico, Tamaulipas, many years ago. The stand was located at the corner of the municipal market one block from the Maritime Terminal; it was a busy area since the train station was also close by. For some reason, these sandwiches were only sold in the evenings. Sometimes my dad would buy some tortas to bring home for dinner, but since we didn’t live close to that area, the sandwiches were already cold when my father arrived home. We still enjoyed them anyway, since it wasn’t very often that we got to have them. Nowadays, I prefer to have them cold, just to go back in time to those moments with my dad! One of the things that made this sandwich so special was the salsa. Local sandwich vendors always offered their own bottled salsa, found alongside the traditional pickled jalapeños and carrots used to spice up the sandwich. I posted the recipe for the red-hot bottled sauce last week and you can find the link HERE, but you can also use a store-bought red sauce. It really changes the whole flavor of the sandwich. 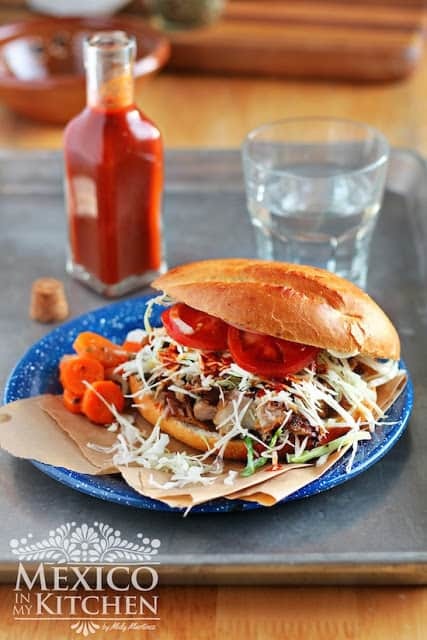 In Mexico, tacos are the number one favorite street food, but tortas are in second place. Kids take them to school for lunch, since most schools don’t offer a cafeteria service. Heat a griddle over medium-high heat. When hot, place the rolls upside down to warm. This will take about 1 minute, then remove. Spread mayonnaise on one side of each roll and beans on the other. Divide the carnitas between the two bottom sides of the rolls. Top the meat with the shredded cabbage, tomato, and onion slices. Finally, place the tops of the bread on the sandwiches. 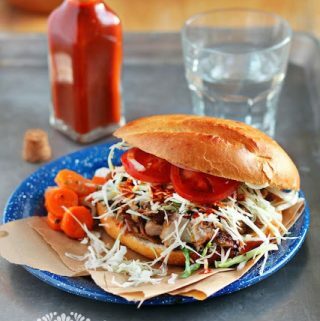 In Mexico, tacos are the number one favorite street food, but tortas are in second place. Kids take them to school for lunch, since most schools don’t offer a cafeteria service. Mexican Pork Carnitas Torta. Cut the rolls in half lengthwise, and remove some of the crumbs from the middle of the bread. * You can also use baked pork or cooked pork meat. If you want your torta to be crispy, place on the hot griddle again, making sure the tops don’t fall off and add some butter or oil to the griddle. Heat the tortas, while pressing down with a spatula, turning once for about 1-2 minutes per side. To serve, drizzle with some hot bottled sauce or add some pickled carrots. M-m-m-m-m, Sounds soooo gooood!! 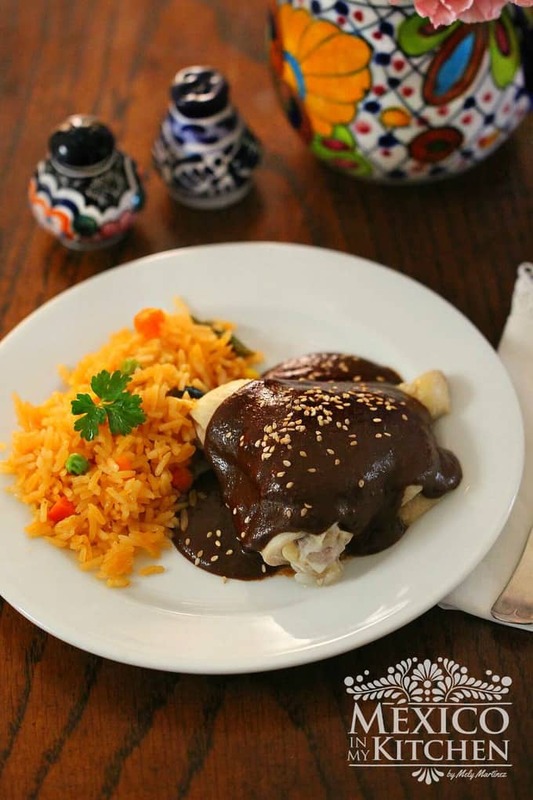 I have to try this including the home made hot sauce!! Hoy no es dia de guisar, y tu entrada de hoy me lleva directo al mercado a comprar las carnitas para hacer unas riquisimas tortas como las que nos dices. Mil gracias. My mom loved this recipe! She sent me the link and now I'm dying to try it too. I bet it's delicious. Thank you!